Clench, W.J. & R.D. Turner. 1956. 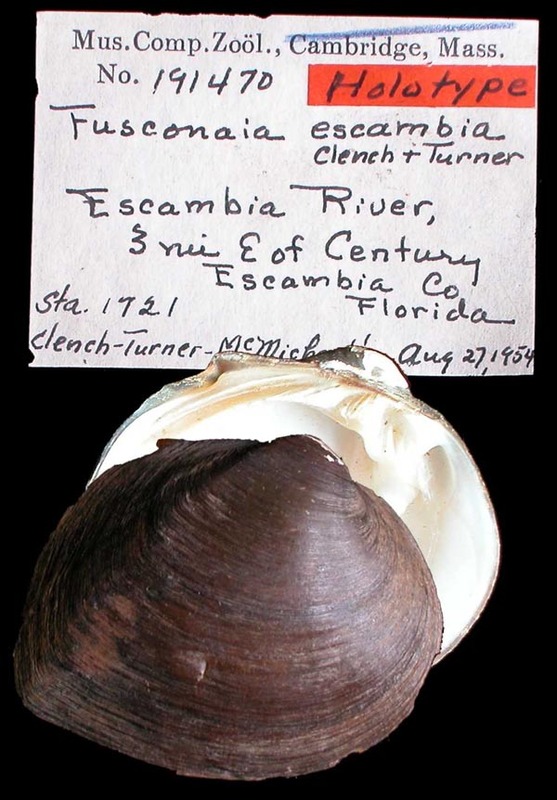 Freshwater mollusks of Alabama, Georgia, and Florida from the Escambia to the Suwannee River. Bulletin of the Florida State Museum, Biological Sciences 1: 97-239. Elliptio mcmichaeli Clench & Turner, 1956. Clench & Turner, 1956, Bull. Fla. State Mus. : 170, pl. 7, figs. 1-2. Type(s): HOLOTYPE (ORIG. DESIG.) 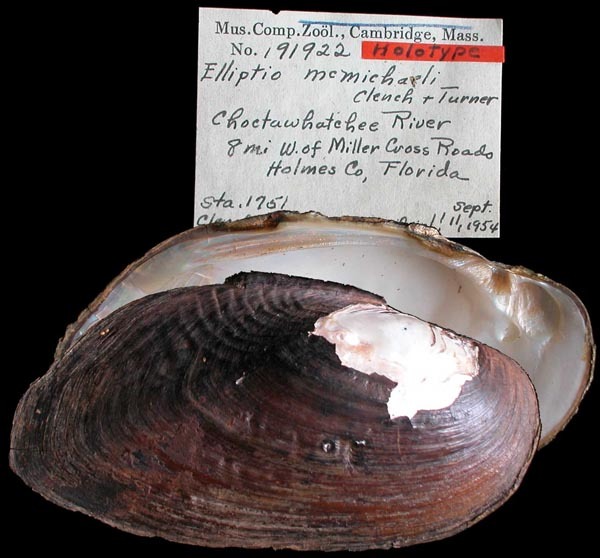 MCZ_191922, Choctawhatchee River, 8 mi W of Miller Cross Roads, Holmes Co., Florida. Fusconaia escambia Clench & Turner, 1956. Clench & Turner, 1956, Bull. Fla. State Mus. : 152, pl. 7, figs. 3-4. Type(s): HOLOTYPE (ORIG. DESIG.) MCZ_191470, Escambia River, 3 mi E of Century, Escambia Co., Florida. Unio accultus Clench & Turner, 1956. ‘Lea’ Clench & Turner, 1956, Bull. Fla. State Mus. : 166. Unio invanutus Clench & Turner, 1956. Alasmidonta triangulata (Lea, 1858). — Clench & Turner (1956: 180). Anodonta cowperiana Lea, 1840. — Clench & Turner (1956: 183). Anodonta gibbosa Say, 1824. — Clench & Turner (1956: 184). Anodonta hallenbecki Lea, 1858. — Clench & Turner (1956: 186). Anodonta imbecilis [sic] Say, 1829. — Clench & Turner (1956: 187). Anodontoides elliottii (Lea, 1858). — Clench & Turner (1956: 182). Carunculina paula (Lea, 1840). — Clench & Turner (1956: 193). Crenodonta boykiniana (Lea, 1840). — Clench & Turner (1956: 157). Crenodonta neislerii (Lea, 1858). — Clench & Turner (1956: 159). Elliptio chipolaensis (Walker, 1905). — Clench & Turner (1956: 175). Elliptio crassidens incrassatus (Lea, 1840). — Clench & Turner (1956: 171). Elliptio mcmichaeli Clench & Turner, 1956. — Clench & Turner (1956: 170). Elliptio sloatianus (Lea, 1840). — Clench & Turner (1956: 173). Elliptio strigosus (Lea, 1840). — Clench & Turner (1956: 165). Fusconaia escambia Clench & Turner, 1956. — Clench & Turner (1956: 152). Fusconaia succissus (Lea, 1852). — Clench & Turner (1956: 150). Glebula rotundata (Lamarck, 1819). — Clench & Turner (1956: 192). Lampsilis anodontoides floridensis (Lea, 1852). — Clench & Turner (1956: 201). Lampsilis australis Simpson, 1900. — Clench & Turner (1956: 199). Lampsilis claibornensis (Lea, 1838). — Clench & Turner (1956: 203). Lampsilis excavatus (Lea, 1857). — Clench & Turner (1956: 198). Lampsilis subangulatus (Lea, 1840). — Clench & Turner (1956: 196). Margaritana hembeli (Conrad, 1838). — Clench & Turner (1956: 148). Medionidus penicillatus (Lea, 1857). — Clench & Turner (1956: 189). Pleurobema pyriforme (Lea, 1857). — Clench & Turner (1956: 162). Pleurobema strodeanum (Wright, B.H., 1898). — Clench & Turner (1956: 161). Quincuncina burkei Walker in Ortmann & Walker, 1922. — Clench & Turner (1956: 155). Quincuncina infucata (Conrad, 1834). — Clench & Turner (1956: 153). Uniomerus obesus (Lea, 1831). — Clench & Turner (1956: 177). Villosa lienosus (Conrad, 1834). — Clench & Turner (1956: 205). Villosa vibex (Conrad, 1834). — Clench & Turner (1956: 209). Villosa vibex amygdalum (Lea, 1843). — Clench & Turner (1956: 211). Villosa villosa (Wright, B.H., 1898). — Clench & Turner (1956: 213).